What is the NYC Multiple Listing Service? Is there an official NYC Multiple Listing Service that New York City real estate brokers use? Is it possible for a NYC For Sale By Owner seller to pay a flat fee to list their home FSBO on the NYC MLS? There is much confusion on this topic as most regions of the country and even most counties in New York State* are serviced by a local Multiple Listing Service, which is a shared listings database between cooperating real estate brokers in a region or city. A MLS is traditionally owned and operated by a local Realtor Association. However, this is not the case for the New York City real estate market. In this Hauseit article, we explain exactly in which broker database New York City FSBO sellers should list their property. We also explain how NYC FSBO sellers can get listed in the right broker database and avoid many online misleading flat fee MLS packages which won’t result in full buyer exposure. *For example, Westchester, Bronx, Orange, Putnam, Queens, Dutchess, Ulster, Rockland and Sullivan Counties are serviced by the Hudson Gateway MLS. In Long Island, Nassau, Suffolk and Queens County is covered by the Long Island MLS. The truth is, NYC is a very peculiar place and a traditional NYC Multiple Listing Service has not existed for a long time, ever since the Real Estate Board of New York (REBNY) left the National Association of Realtors (NAR). What MLS or broker database do agents use in New York City? Believe it or not, New York City does not have one widely used MLS like in the rest of the country. While the city does not have a dominant Multiple Listing Service like most regions of the United States, it certainly has a small foothold by the National Association of Realtors (NAR) called the Manhattan MLS which is operated by the Manhattan Association of Realtors (MANAR). In 2016, MANAR merged with the Hudson Gateway Association of Realtors (HGAR). The Manhattan MLS has been since absorbed by the Hudson Gateway MLS (HGMLS). The Multiple Listing Service is a term for an inter-broker database operated by a local trade organization affiliated with NAR. Since REBNY is not affiliated with NAR, the broker database they operate called RLS (REBNY Listing Service) is not technically a MLS. Rather, it is a private shared listings database operated by a private real estate association based in New York City. However, because the vast majority of NYC brokerages do not belong to the National Association of Realtors or the Manhattan MLS, it’s not very effective to have your property listed on the Manhattan MLS. Instead, most NYC brokerages are members of the Real Estate Board of New York (REBNY). REBNY is a private real estate trade association based in Manhattan. 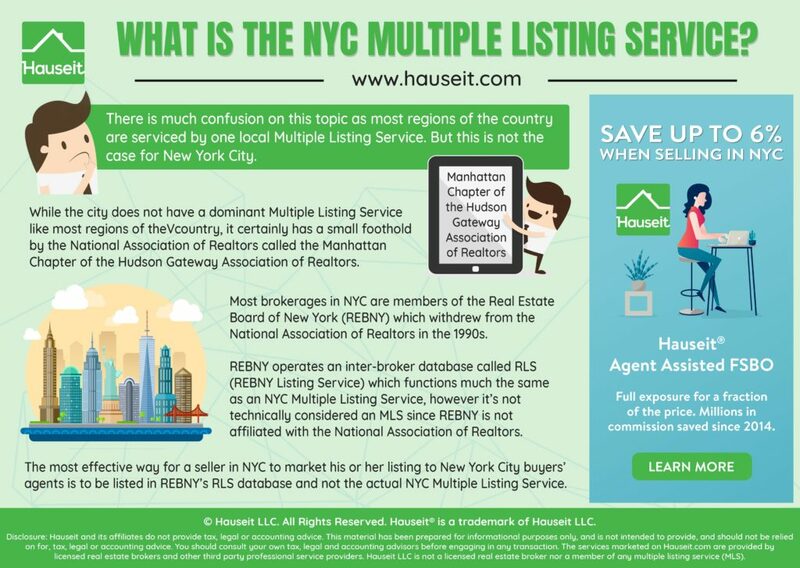 REBNY operates an inter-brokerage database called RLS (REBNY Listing Service) which functions much the same as a NYC Multiple Listing Service. Therefore, the most effective way for a FSBO seller in NYC to market his or her listing to New York City buyers’ agents is to be listed in REBNY’s RLS database and not any other NYC Multiple Listing Service which will be dramatically less popular among NYC brokers. All REBNY members and any brokerage with business in New York City is eligible to receive and push data to the RLS. Because REBNY members and RLS participants are contractually obligated to keep listings up to date, typically within 24 hours for listing updates subject to heavy fines for non-compliance, RLS data tends to be more accurate than that of consumer websites such as Brownstoner or StreetEasy. A consumer website will typically refresh the data for their agent listings once every day or two from a RLS vendor (i.e. Nestio, OLR, RealtyMX or RealPlus who offers listing syndication, search and CRM functions for agents). However, because an agent is required to update listing changes to RLS (via their RLS vendor) almost immediately or be subject to penalties and fines, and because RLS refreshes their feed almost instantaneously, the data from RLS and available to brokers is typically much fresher. How do I get listed on the RLS (REBNY Listing Service) as a NYC FSBO seller? The first thing a potential NYC FSBO home seller needs to do is step back and evaluate the packages being offered by various For Sale By Owner websites in NYC. What MLS will they list you on? What real estate websites will your listing be posted on? All the large, national For Sale By Owner websites who pay tens of thousands of dollars per month on Google Adwords will promise you to list your home on your local MLS. But as we said, NYC does not have a traditional Multiple Listing Service. So what exactly are these services promising you by saying they will list on your local MLS? This is an extremely important question to answer because many of these services will charge thousands of dollars for your flat fee listing. Don’t throw money out the window! The truth of the matter is, without further investigation, you would have ended up paying for a listing in some irrelevant MLS such as the New York State MLS, the Capital Region MLS or some other brokerage database that virtually no NYC brokers actually use. The more infuriating thing about most of these misrepresented flat fee NYC MLS packages is that they often cost $1,000 or more and won’t even list you on the most relevant, paid local search websites for unrepresented buyers like the New York Times, StreetEasy or Brownstoner. You end up paying $1,000 or more for an incoherent package of listings on free websites such as Zillow, Trulia and Homes.com. What’s more, 99% of the websites they offer to list you on receive no relevant traffic for a NYC home seller (either it receives no traffic period, or it is completely irrelevant to the NYC real estate market). As a result, you could have listed yourself for free on just the most popular websites like Zillow and Trulia without wasting $1,000 or more. However, what you thought you were paying for was a NYC Multiple Listing Service listing so you could attract the tens of thousands of New York City brokers representing over 75% of NYC home buyers. Unfortunately, what you get in the vast majority of cases (the exception being a locally focused listing service like Hauseit) with these large, “national” for sale by owner websites is an extremely expensive mark-up for listing you on a dozen free websites. What’s worse, many of these large For Sale By Owner websites don’t even bother to hide the fact that you are a FSBO listing. They openly watermark your photos and even put their website URLs in your listing description which only makes it easier for hungry brokers to target and solicit you for a full commission listing with them. While brokers are typically prohibited by license law and trade association rules from soliciting owners already under an exclusive listing contract, they are not prohibited from outreach in the case of For Sale By Owner website listings. The reason is most of these websites are not members of the local trade association nor brokerage database in NYC and thus not protected by its rules; moreover, the listings are so openly FSBO that it is a grey zone of whether the home seller is truly already represented. In short, if you aren’t careful when selecting your New York City Flat Fee MLS provider, you run the risk of being listed on the wrong MLS, missing out on key websites and also being harassed by agents who don’t have any real buyers for you. This may lower your NYC FSBO success rate and/or decrease your sale price. How can I ensure that my NYC FSBO listing is posted on the most relevant websites and databases for New York City? As a New York City FSBO home seller who is willing to work with buyer’s agents, it’s critical that your home is listed on the RLS (REBNY Listing Service) and not just any other MLS like the New York State MLS or the Manhattan MLS. You must fully understand that there is no such thing as a real New York City Multiple Listing Service before you decide on a NYC Flat Fee MLS listing provider, and make sure you investigate very clearly exactly what inter-broker database they plan to list you on. 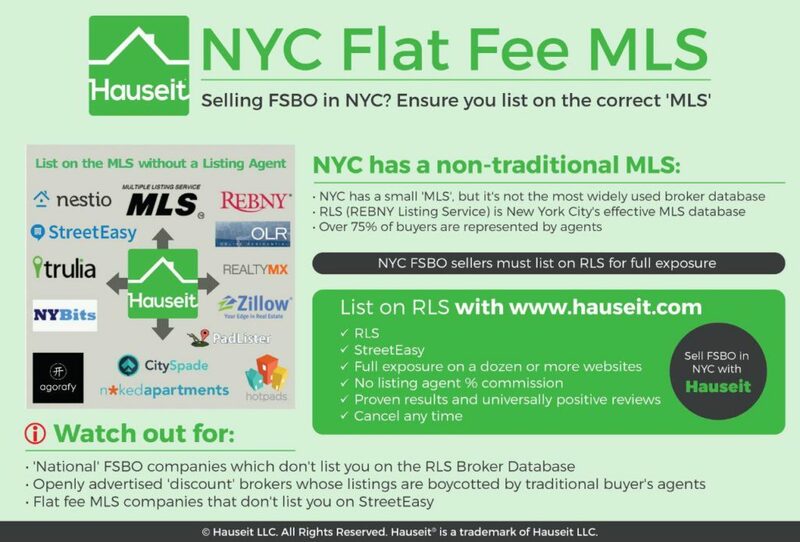 Hauseit is a top-rated and locally focused New York City For Sale By Owner listing service whose partner brokers lists its NYC FSBO sellers on the most relevant websites and inter-broker databases that actually matter in New York City. For NYC FSBO home sellers, Hauseit will ensure customers’ homes are listed on the REBNY RLS broker database as well as all of the technology vendors used by NYC brokerages which receive the RLS feed, such as Nestio, RealtyMX, RealPlus and OLR as well as brokerage specific databases like Taxi and Limo. How do I work with buyer’s agents as a FSBO seller in NYC? Buyers’ brokers control over 75% of home buyers in New York City. Therefore, promoting your home to them is critical in order to maximize the visibility of your listing and increase your chances of multiple offers. Listing on the RLS broker database through Hauseit is a great start, but you must also know how to deal with buyer’s agents in NYC so that you can keep them motivated and focused on your listing. 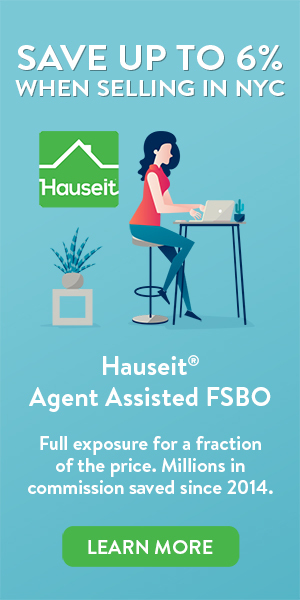 NYC home sellers who’d like to save or reduce their commission bill but don’t have the time or interest in dealing with buyer’s agents should consider Hauseit’s 1% for Full Service listing option.